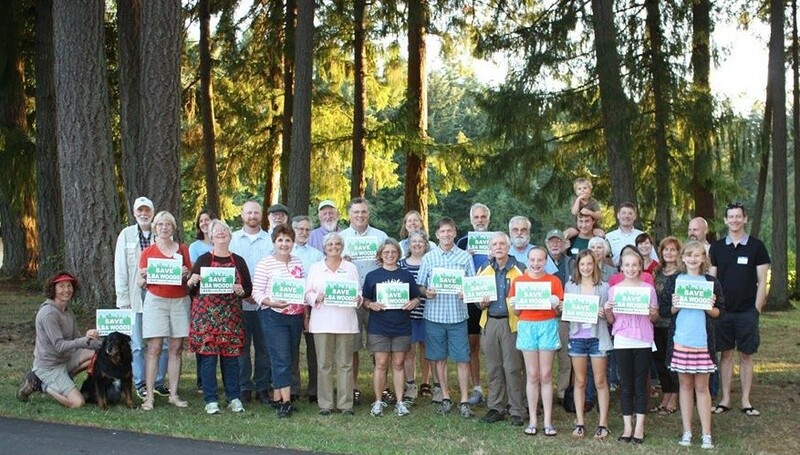 Just a small contingent of our volunteers who helped make a difference in Olympia! Thanks to our thousands of supporters and hundreds of volunteers, our campaign to Save the LBA Woods has succeeded! On March 1, 2017, the “Bentridge” parcel was acquired as parkland for the City of Olympia. Our vision is a reality! Though this phase of our work is done, the LBA Woods Park Coalition will remain active in the future or our new park and hope you will stay involved. There are many decisions to be made on how the park is developed to reflect the needs of our community. We have formed a Friends of LBA Woods stewardship group and are working with the Olympia Parks Department to begin removing invasive species from the park. We will be hosting regular work parties–everyone is welcome! We will post dates and times here (on our blog and also on our Facebook page). A happy crew of volunteers at our December 2016 work party. Like us on Facebook to learn the latest news of Work Parties (above) and other events. Share our posts with your friends. Respond to our Action Alerts. Sign up here to receive these e-mail alerts, news, and event notifications (good for non Facebook users). Thank the Olympia City Council and Mayor for purchasing the LBA Woods as parkland.